Okay, imagine yourself at home. Baby's crying, someone's at the door, telephone's ringing, it's about to rain and your clothes are still on the clothesline, and the water at the sink's running. All this is happening at the same time. Which would you attend to first? Of course I had 101 questions to ask. How old is the baby? Where is the baby? Is it on the bed? On the floor? What kind of phone is it? Is it the housephone? Or handphone? "Eh, just answer laa" was my friend's reply. Hmm, I think I picked up the phone, picked up the baby, opened the door, took in the clothes and switched off the water. Apparently, work came first, then family, then friend, eek don't remember what clothes represent now and next is money? My God! Where is my memory going? Not really happy with the answer. I don't think that it's representative of me. This always happens to me. I really am not very good in this psychological stuff. I remember back in uni, my lecturer, Mr Martin, also decided one day to give us psychological questions and we were asked to close our eyes and imagine a pathway (What did that pathway look like? Was it long? Straight? Narrow? Winding?) and then we came to a house (What did the house look like?) and what was in that house, et cetera. I remember answering that the house was old, dilapidated and falling apart. I remember that when I tried to open the door, the door came off in my hand. But inside, it was full of treasure, and a skeleton with a sword was lying next to the treasure. Mr Martin looked at me with interest and gently, he went, "Are you happy at home? How are you and your parents?" "Whaaa!" I've never been closer to my parents at that time. It was so funny! Anyway, as usual I digress. My friend was saying, here's a question you should ask your husband. Hubby, if I got into a fight with your mom, and I run off North and she runs off South, who would you go after? According to her, the answer should be, "run after the wife" because if you don't run after the wife, she might not come back; whereas if you don't run after your mother, she'll always be your mother. Anyway, I tweaked it a little. So now it sounds like this: "Zul, if I quarrelled with your Mom and I run in one direction and she in another, who would you go after?" "In the first place, why are you quarrelling with each other? I know you better than to do that. I'd be very disappointed in you if you did. And I'd be very disappointed in Mak if she did!" As you can see, my husband totally side-stepped the question, and in a way, complimented me because he said he knew me better and I'm not that kind of person. And no matter how I tried to get him to answer, he managed to evade it. Then the next day, I don't know over what, but my hubby and I had a small disagreement and I asked kids, "If Mommy and Daddy fought, and Mommy ran right and Daddy ran left, who would you chase?" Without any hesitation, Mika's voice rang loud and clear, "I follow Daddy! ", this was followed by a loud and smug snicker; and Inez hugged me and said "I follow Mommy." And I kissed my 'idiot' son and told him he's a good boy and kissed my Inez and told her she's a good girl. Well, that was to be expected. Inez has always been very attached to me, and Mika on the other hand, though, quite attached, always reasons that he should follow his daddy coz he's a boy and Daddy's a man. Inez's a girl and therefore should follow Mommy coz Mommy's a girl too. Ah children...they can be so cute. Husbands too. Hmmphh, it turns out Responsibility is no longer in Kuantan. There flies my chance at 8K. Anyway, Kedahans, GO GO GO. GO GET RESPONSIBILITY! It just so happens that the Mix.fm HSBC Amanah Team Member is in Kuantan. ( S)he has been here since yesterday and we missed the first bounty period. The clue was green. Immediately Megamall came to mind but at 5:30 p.m., the clue was 'town' and at 6:30 p.m., the clue was 'sick'. At first we went to Kemaman Kopitiam because it had the name of a town in it, and then when we heard the clue was 'sick', we went to KMC and HTAA but...nothing! Someone called up to say that REsponsibility was in Pekan, but we couldn't believe (s)he would go so far from Kuantan; and so we linked the clues together, and came up with Old Town Kopitiam, and guess what? Right next to it was Klinik Pekan, we thought we had it for sure and asked everyone in sight. At 7:30, it was revealed that (s)he was really in Pekan! What a bummer! Though we didn't go a-hunting, we pondered over the clues. First clue was 'fast' and second was 'five' and the online clue was 'end', and though I guessed it must be fast food, we couldn't think of a 'where' because we didn't think Responsibility would be able to get to Teluk Chempedak in time but apparently (s)he did coz that was where (s)he was! Today, the clue is 'Plaza', 'Peace' and 'Hotel'. We're hoping that (s)he's still not found so that we can go try our luck this evening. Oops, maybe only my husband will do it coz I'm judging a drama competition tonight. Can't wait to see the performances. Adapting to School: To change or not to change? It's been some time since my last blog and I'm surprised that I miss blogging considering that I am a reluctant blogger. My sis got me into this and I have to say thank you to her as this is like an outlet of venting and sharing. I was talking to a friend the other day and she was telling me that her son, too, had problem adapting to school. Like Inez, he didn't know how to interact with the other kids and preferred adults. According to my friend, it took her son 6 months before he finally liked school. After that talk, I was very relieved. So, it's quite normal for a child to take ages to adapt to school but thankfully also, a week ago, Inez came back all smiling and school had suddenly become "Great!" "Why...do you have friends now?" Inez happily nodded her head. "Clever Inez, Mommy's very proud of you. So, what are their names?" Apparently, they shared a common liking for Madeline, who is very talkative and knows everything. So when we went to Mom's, we were very excited to inform her that Inez had friends. Amazingly, my mom wasn't surprised. Turns out that my mom had tricked my daughter. She told Inez that the previous night, she had a dream that Inez had two friends: Yan Yan and Honey and gave complete details of how the friendship started and what exactly was said. I was amazed. "How did you know her friends would be Yan Yan and Honey?" "I didn't. I only said Yan yan because the name is quite common and Honey, because Honey always calls to Inez, but when Inez goes to her, they both become quiet. They don't know what to say to each other." And three days ago, school was also great because she'd learnt to tie her shoelaces! Despite Inez beginning to enjoy school, my Mom and husband (coz they send her to school) have discovered that she is afraid of her teachers. I don't know which one or which ones. Once, my husband called to say that Inez was afraid to touch the teacher's 'little things' because the teacher would chop off her hands. Then, my mom called to say that Inez has left one of her books at home and she was very afraid to enter school. My mom had to talk to the teacher who reassured my daughter that it was okay but she should not repeat the action. Today, they spent the whole morning trying to locate her Science book which was all the time in the front pocket of her bag. So, should she be afraid of her teachers? Or is this normal? Inez is still on trial with this school. If this is how it is, should I continue to send her here or change school? I stumbled upon this story about Patrick Combs called Bank Error In My Favor: Collect $95,000 (Original Version) when I was googling. What happened was he deposited a junk mail cheque into his account and it cashed! He couldn't believe it because he really didn't expect it and he knew sooner or later someone would come asking for the money; but for the fun of it, he decided to put it in a safe deposit box. After all, wouldn't it be fun to walk "into a vault, go behind the curtain and open a box full with $95,000 cash?!" Sure enough, as he predicted, the banks did freak out and freezed his account. He was accused of fraud. He decided it was time he learnt his rights. So, give it a go. Read how he battled with the banks and come out smelling like a rose. We know that the phrases used are nursery rhymes that allude to childhood which is basically what the father character is missing. It simply wants to illustrate that childhood is precious and that it passes quickly. Once gone, it's gone forever; and by the time you want to catch up, the child already has a life of his own. I also came across the website with reference to Cat's Cradle, a string configuration, where various designs are created by interweaving a longish loop of string around the fingers of both hands. Do you know the name of your flowers? This is embarrassing but it must be told. We are at the moment organising Language Fest and one of the activities is Explorace, which although includes physical activities, focuses mainly on language games. And one of the language games is called Guggenheim which is basically like the game called 'Nama Negeri' which we used to play when we were in school. We'd draw a frame and in the first column, we'd write NAMA (i.e., names), NEGERI (i.e., states), BINATANG (i.e.,animals), BUAH (i.e., fruits) and BENDA (i.e., things). Then, to play, you'd need a minimum of 2 players and the first player would call out a letter and we'd fill the columns with words that began with the letter called out, and so on. But in this Guggenheim frame, in the first column, the letters are already given, and the categories are slightly different: ANIMAL, CITY, FLOWER and FOOD. So before we gave this out in the race, we thought it'd be better if we try it out first and guess what, we got stumped in the FLOWER category. It's not that easy when you don't know the names of your flowers? So, do YOU know the names of your flowers? So far, Inez has gone to school for 4 days. Every day after school, I'll ask her what she has learnt, and to date, her answer has always been 'Nothing'. "Inez, are you saying I'm wasting my money sending you to school?" "So it's okay if you don't go to school?" Oh dear, should I consider homeschooling for her? I wonder. Anyway, I think she's just trying to dissuade me from sending her to school coz she wants to stay home and watch Playhouse Disney. However, on a heavier note, she is very shy. Apparently she has not really interacted with the other kids. She speaks only to her teachers. I guess that's why school doesn't appeal to her. I observed her the other day when I picked her up from school, she was playing by herself and although another girl tried to get close to her, Inez just moved away from her. Mimi attended school a day after Inez but in Kajang. It's also Montessori but unlike Inez, Mimi has so many things to say about school: e.g. she pretended to be a chicken laying egg, and when she left school, she said,"Bye bye friends!" Again, we'll just have to give Inez more time to learn to socialize. I told her that it's important to go to school. "Because we don't know everything." I gave up. "That's because Mommy went to school. Inez, everybody knows something but not everybody knows everything. That is why when you talk with other people, you'll learn something from them." "For example, Inez knows how to draw flowers. Maybe Jonathan (one of the boys in school) knows how to draw a kangaroo." "But Jonathan doesn't know how to draw a kangaroo." "So how would you know that unless you find out?" I gave her some examples, and I don't know if she'll use them but I guess she needs the time and space to get used to having a lot of children around her. As is my routine, when I get home and I water my plants. Yesterday was no different. But yesterday, a very horrible un-neighbourly feeling got into me. While watering my plants, I smelled some cat poop. In my head, I went, "Oh noooooooooooooooooo! Not again!!" followed by a lot of rude thoughts about the culprit and its owners. I beseech all cat owners, "If you're gonna keep a cat or cats plural, please keep the cat poop on your side of the fence. Get a kitty litter, for God's sake! `coz I swear I'm gonna dig that poop out and throw it back to where it came from! I mean, if it's that easy to keep a cat, then I too would like to keep a cat and train it to poop in MY neighbour's garden!" I know it seems like I'm ranting like a madwoman but it's just common courtesy plus I'm trying to grow a garden here! A cat's poop will just kill it. It's happened before. One of my mostest favouritest flowers is the hydrangea (Hydrangeas are just so pretty!) and I have invested in a few plants, mainly because the ones I bought didn't flower and if you're also into gardening, you'll know that hydrangeas aren't cheap. 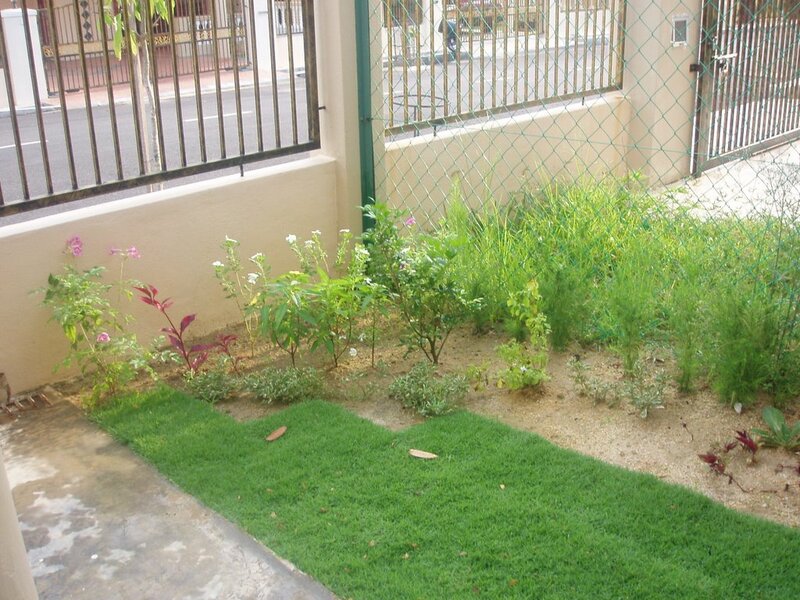 Anyway, I had one when I was in Shah Alam and it was always flowering until one day a dratted stray cat decided that my plant was a good place to poop. I smelled the poop but didn't realise where the smell came from and by the time I discovered it, it was too late. Even though I dug my plant out, changed the soil, there was no saving it. And ever since then, all the other hydrangeas I've bought have not flowered, even though the plant came with a flower or two when I bought it. 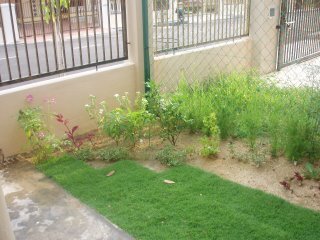 Someone advised me to not plant it in a pot but to dig a big hole, put some good earth in it and plant it in the ground. What good would that do if I've a got a daily visitor who does her business in my garden PLUS she's recently just given birth a litter of kittens...hmmm...more kitty litter in my garden? Mika wanted to listen to the Arabic alphabet song. He also wanted to type his name on the computer. I had to explain to him a few times that my computer is out of order. It needs to be repaired and so far Zul hasn't got the time to send it to the service centre, which by the way is in KL. You know the IBM building in Taman Tun. So, duh... It'll be some time before my laptop gets fixed. God forbid, sometimes I wonder whether it’s the solution provider that’s creating the problem so that we go get the solution the provider’s providing. Catch my drift? Haha now I feel like an amateur conspiracy theorist. This must be the umpteenth time I’ve been struck by computer viruses and believe me, I am not a happy person. The first time it struck, I was doing my Masters. I relied heavily on my computer and was in the midst of completing an assignment. I don’t even know how it happened and when it happened but my desktop hard drive was affected. For example, today I could open my word document but it takes very long before the words I type appear and then the next time I try to open Words, Words no longer exist! I’m like, “What’s going on here?” So I open Excel instead, and guess what, the next time I try to open Excel, it too has vanished into thin air. By the third day, when I turned on the PC, I faced a darkened screen, nothing appeared. I took it to a shop and thankfully I only had to fork out like RM250 if I’m not mistaken. Then, the next time it happened was in February this year to my office desktop. I was preparing activities and notes on IELTS Academic Reading Module as we were having a class on Valentine’s Day (How romantic...reading texts on Valentine’s; I told the trainees it’s my Valentine’s gift to them, haha) and I was struck with the Brontok Virus. It’s so not funny despite its funny name. I had scanned some documents using a friend’s laptop and transferred the virus from her PC to mine. (In fact, much to my friend’s dismay, quite a number of people experienced virus problems because of her laptop.) It slowed down my application and my desktop just wouldn’t shut down. Every time I shut it down it automatically turned back on. Thankfully, it was a popular virus and the solution was found on www.freegrisoft.com where one could download AVG to combat the virus. It took me two days to get my PC back in working order and fortunately in time to print out my IELTS handouts for the class. Now, I acn't use my laptop because of some Trojan virus and a pesky pop-up that keeps appearing even after I have cancelled it many times. (It’s something to do with getting connected to the internet.) I have since moved my files elsewhere but I cannot reformat my computer. Somehow the formatting part has been disabled or something. This time I also know where I got this virus, my mom became addicted to playing games online for a short period of time (just for one night), and after that night, my laptop was never the same again. Well, I’m not blaming my mom as the virus protection in my laptop was out of date and I have not installed AVG, had installed it only in my office desktop, which lately keeps getting 'hanged' by the way. And lately, I also keep getting this worm virus in my pen-drive. I have reformatted my pen drive 3 times because even after the virus has been detected and ‘healed’, there’s always an error in reading my files or folders. I guess that’s the hazard of using common computers. It’s really tiresome. So, Mika my dear, we'll wait till Daddy comes home and we use his computer, ok?